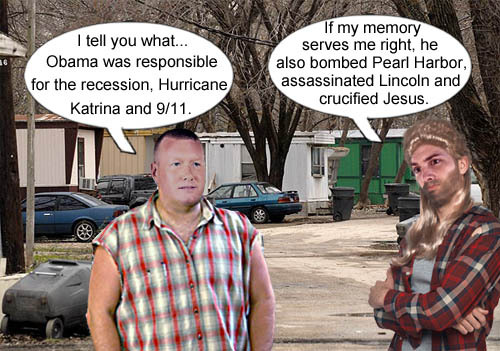 From the “You’ve Got to be Kidding” file…According to a recent poll, apparently almost 30% of Louisiana Republicans think that Obama was responsible for the horrendous response by FEMA to Hurricane Katrina in 2005 despite being almost 3 and 1/2 years before Obama even came into office. And almost 45% aren’t sure whose fault it is. Only 28% thought Bush was responsible for the lousy response. It appears that certain members of the GOP species (elephantus redneckius) have a truly serious memory problem. Unfortunately, it also appears that Obama has officially replaced Bill Clinton as the new Republican scapegoat for all the woes in the world. 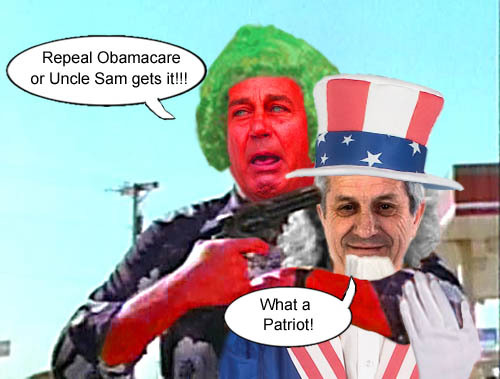 A couple of Louisiana Republicans kick back and have an intellectual discussion about American history as they see it. RNC Chairman, Reince Priebus, recently made an announcement that Republicans will ban MSNBC and CNN from the Republican primary debates in 2016 if they don’t drop plans to air projects about Hillary Clinton, who will more than likely run for President in 2016. Yep, once again, the crybabies of the GOP are demanding that everybody does what they want or else. They’re certainly doing what it takes, too, to advertise themselves as inclusive and tolerant of the various demographics which makes the United States such a melting pot. Let’s review some of their triumphs: they want to enforce voter ID in order to suppress the black vote; the only kind of immigration reform they support is building a wall across the Mexican-American border; they think the government should stay out of people’s lives unless you’re a woman, which in that case, allows the government to patrol every woman’s uterus; they’re against gay marriage or really any kind of equal rights for gays, lesbians or transgendered people (just stay in the closet folks); they don’t want healthcare for anybody unless you can afford to pay the astronomical expenses associated with today’s medicine; they want to push christianity down everybody’s throats as the only religion to be allowed in this country; they value the rights of the gun shooter over the rights of the gun victims; they portray any scientist who proclaims that climate change is real to be a fraud. Yes, by all means, let’s keep electing these irrepressible zanies to run our country. 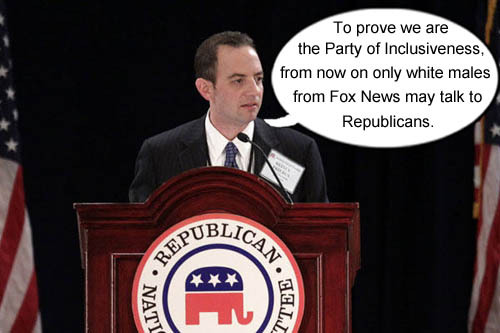 RNC Chairman, Reince Priebus, lays down the new rules that journalists must obey when dealing with Republicans. Recently, RNC Chairman Reince Priebus stated in an interview with the Christian Broadcasting Network (CBN) “I don’t know if I’ve used the word ‘tolerance,’ I don’t really care for that word myself”. It’s stunning that today’s christian conservative Republicans are such blatant hypocrites. Let’s review a little: today’s modern, conservative, christian Republican, should not want their neighbors to have affordable healthcare; should not give any kind of opportunity to anyone from another country who has come to this country in search of a better life; should mistrust anyone who has a different skin color; should hate anyone who has a different religious point of view; should not allow a woman to make her own health decisions in regard to her reproductive system; should despise people who have different sexual orientation; and should own several guns and use them if they are EVER threatened by the aforementioned groups of people. Yep, tolerance is very overrated. Jesus would surely be proud of today’s christians. 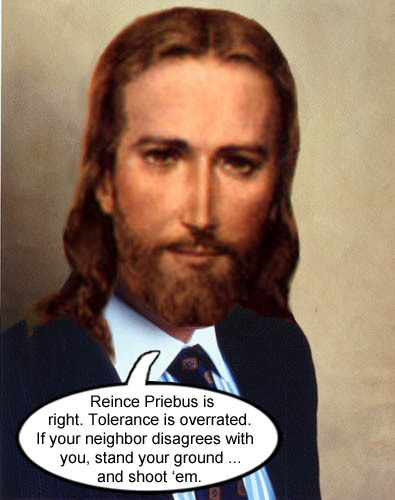 Capitalist Jesus, who is also very Republican, lends support to his disciple, RNC Chairman Reince Priebus, on how overrated tolerance is in today’s overpopulated world.